There is a great deal of excitement in Honolulu in these days running up to Go Jimmy Go’s “A Hui Hou! 20-year Reunion & Concert” that will serve as the legendary ska/soul/funk band’s grand and final overture. It will certainly be the biggest local indie show of 2016 thus far, and judging by the buzz around town, Saturday’s concert at The Republik may just end up being the concert of the year for devoted fans of live music in Honolulu. Related events will take place at various Honolulu locations throughout the weekend. But there is a variety of reasons that visiting live music fans would do well to seek out the shows, too. Go Jimmy Go will be performing their vast catalog in the order of its creation, from the first of their five studio albums to their last. 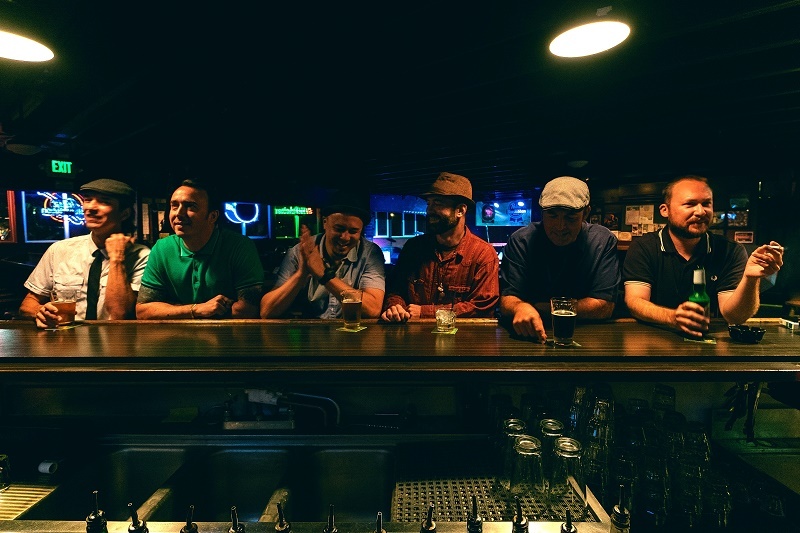 Although the band’s personnel has changed over its two decades, seven past members will step under the lights on Saturday night to perform the material they had an individual part in making and performing. Even for visitors who may have never heard of the band, this concert will provide a real look into one hard-working Hawaii outfit’s growth over a twenty-year run. The Go Jimmy Go lads at the bar where it all started. Go Jimmy Go has toured extensively throughout the U.S., Europe and Asia, and many of the legion of friends they made along the way have flown out to be a part of the show. Monkey is billed as the “hardest working ska band in California” and they will open the show. (They’re also celebrating their own 20th anniversary.) Jesse Wagner of the Aggrolites will perform with his All-Star Band. All that before Go Jimmy Go takes the stage. That’s value! But what makes this a once-in-a-lifetime concert event is the amount of genuine aloha that comes with it. Hawaii residents tend to claim a special pride when local boys and girls do well on distant shores, and Go Jimmy Go fans know how far the band has come. From playing inside bullet-pocked buildings in eastern Europe and enjoying great success in China and other Asian markets, to slogging it out on the frenetic Vans Warped Tour in the American Outback or musty big-city dives, Go Jimmy Go has seen it all. At least a whole lot of it, anyway. And it’s easy to be proud of them. Their success comes from their own hard work. They never had a smash hit that put them in the national spotlight, as some other indie bands from Hawaii have. Go Jimmy Go put the time in on the road. Without major label support, much of their promotional and distribution legwork has always been done in-house. Although the hard work required to find the success that Go Jimmy Go has found was done on the road, it’s safe to say that they never really left Hawaii. Each and all, they are the same giggling, wise-cracking local boys that they were when leaving for their first mainland tour so many years ago. A handful of former members have relocated, but most remain here at home raising families, running businesses, and pursuing newer musical interests. Same guys, different priorities. And that is perhaps what makes fans of Go Jimmy Go so fervently loyal and proud. The boys never left us for the promise of something bigger and better far away. Ohana, or family, is everything in Hawaii, and that is why the “A Hui Hou!” show will be so special. It will be a family reunion. It will be a night of nostalgia and fond memories. There will likely be band members’ keiki running about backstage, and backstage will probably smell like a luau. In fact, so thankful are Go Jimmy Go’s members to their extended ohana around the world, they’re holding a meet-and-greet party at the world-famous La Mariana Sailing Club on Friday January 15, the night before the show. La Mariana happens to be a world-famous tiki bar and the location of the photo shoot for the cover of Go Jimmy Go’s album “Girl with the Fishbowl Eyes”. Also Friday, Monkey will be playing the “A Hui Ho! Pre-Party” at Anna O’Brien’s following the La Mariana meet-and-greet. And, in case that wasn’t enough, Go Jimmy Go will also be having an “A Hui Hou! Hangover BBQ” at Kaimana Beach in Waikiki on Sunday. That’s a lot of work for a group of guys with wives and kids, pressing day jobs and spreading gray hairs. But Go Jimmy Go has never let the ohana down. For tickets and a full list of Go Jimmy Go’s “A Hui Ho! 20-Year Reunion & Farewell” events visit: www.ahuihou.gojimmygo.com.